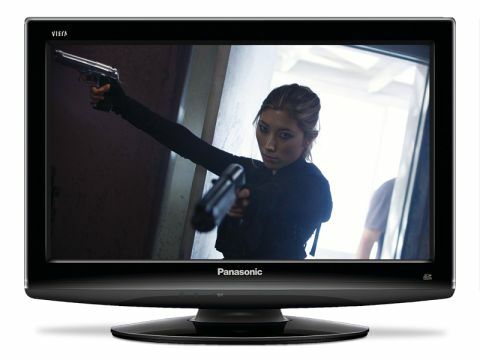 Panasonic does big plasmas well, but can it make a good 19" LCD TV? One odd thing about the small TV market is the willingness of manufacturers to offer different colour options. Even the usually sober Panasonic is offering its 19X10BW in white or black. The company has also seen fit to grace the body with some seductive curves and ridges. Around the back among the connections there's a handy SD card slot enabling people to play digital photos stored on SD cards directly onto the screen. The 19X10's specifications are very credible, meanwhile. Its HD Ready native resolution of 1,366 x 768-pixels, for instance, equates to a proper 16:9 ratio rather than the slightly suspect proportions found on some rivals. Its 4,000:1 contrast ratio looks strong for a 19in screen, too, and its impressively legible onscreen menus host a passable set of tweaks and options, including noise reduction routines, an automated colour management circuit, plus cinema and game picture presets. Many of the other TVs in this group test actually deliver more features than the 19X10. But Panasonic could argue, with some justification, that its set provides you with all the things you actually need on such a small set. Images are given a surprising amount of impact for a 19-inch TV by the screen's impressive brightness levels and by the startling intensity of its colour tones. Even deep reds and greens look very credible and that's something that even the manufacturer's top-spec plasma screens struggle to achieve. Also noteworthy is how sharp the 19X10's images are, as the set proves capable of defining the difference between standard and hi-def sources, even though the TV's processing actually does a far cannier job than most of upconverting standard definition to its HD resolution. Perhaps the most surprising strength of the 19X10 is its black level response. This has been a real weakness of Panasonic's larger LCD TVs, but dark scenes are displayed on the screen with surprisingly little of the usual grey mist and no patches of inconsistency, making it a credible movie-viewing machine – notwithstanding its 19-inch screen size, of course. The set also sounds quite decent. It can deliver good volumes without distortion, as well as believable and well-rounded dialogue, and doesn't fall flat during action scenes nearly as badly as most of its rivals. The only disappointments about the TX-19X10BW are that peak whites aren't particularly crisp and the appearance of motion blur. But while these weaknesses cost the set a picture mark, it must be said that the blur isn't bad enough to be a deal breaker.